The Burlington Age-Friendly Seniors Council’s Housing Committee developed The Halton HomeShare Toolkit for the purpose of providing a self-resource to individuals who are interested in learning more about HomeShare or considering this model as a housing alternative. HomeShare is a living arrangement generally between two people who reside together in the same residence. While each person has his or her own private space, they will typically share common areas, such as the living room and kitchen. Household responsibilities can be shared, or services exchanged for reduced accommodation expenses. Services could include: gardening, household cleaning, shopping, and taking care of pets and more. HomeShare can be good solution for many older adults who wish to remain in their own homes for as long as possible but may find it difficult to maintain household responsibilities. It enables older adults to remain independent and active, while developing meaningful relationships. There are many individuals who may seek housing and due to a lack of available and affordable housing options, HomeShare would serve as a good solution. HomeShare can offer companionship, reduce isolation and provide safety and security. While building awareness in the community of Burlington on HomeShare, and based on the work of the Housing Committee, the Halton Region (Regional Government), is adopting the model and will be implementing the Halton HomeShare Program in Burlington in 2016. The Age-Friendly Housing Committee will serve as an advisory on the process and share recommendations. Although not a new concept in many parts of the world, it is unique to our community and we recognize that HomeShare can be good for many people but not for everyone. HomeShare empowers home providers and home seekers the ability to live in affordable, shared accommodation inclusive of respect, choice, dignity and is of mutual benefit to all. Details on older people's involvement: The Burlington Age-Friendly Seniors Council's Housing Committee is made up of members of the community, older adults who come together to address the strengths, needs, gaps and barriers as it relates to Housing in the City of Burlington. The Burlington Age-Friendly Seniors Council's Housing Committee has been speaking to a number of groups and organizations regarding the concept of HomeShare, why it can fill a need and the benefits. We always state that HomeShare is good for many but not for everyone. In general the response has been extremely favourable and have been approached by many older adults who are interested in sharing their home and also from individuals who are interested in going to live with someone. The Halton HomeShare Toolkit has been requested by individuals throughout the province of Ontario and beyond, across Canada. The Halton HomeShare Toolkit is available as a resource to anyone. Based on the work of the Burlington Age-Friendly Seniors Council's Housing Committee, the Halton Region (Regional Government) has adopted the program so that it will be expanded and implemented in Burlington in 2016. The Housing Committee will act as an advisory. The reflections and lessons learned on the experience of the Age-Friendly Housing Committee were varied. We were able to conduct research on other HomeShare models, in Europe, in the United States as well as in Canada. Other HomeShare Programs were instrumental is guiding the work of the Housing Committee. In Burlington, one in six residents is an older adult, and many live alone in a larger home, so we knew that HomeShare might be a perfect fit for many. There are also many individuals looking for affordable places to rent so HomeShare could be a win-win living arrangement for both. 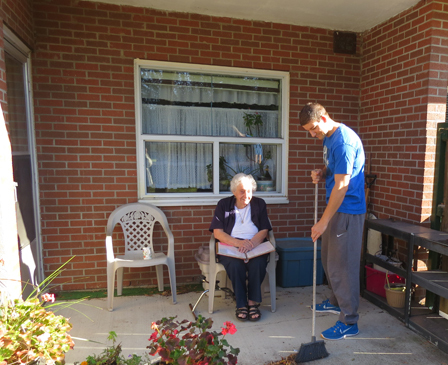 It took over three years, in terms of the initial discussions on the topic of HomeShare, to the development of The Halton HomeShare Toolkit, engagement of the community through presentations and finally, with a HomeShare Program being implemented in 2016. Some older adults would tell us that they could never do a HomeShare arrangement, and we always made it clear that this is a living arrangement that will be good for many, but not for everyone. Our initial goal was to find an organization that could house and implement a HomeShare program as the Burlington Age-Friendly Seniors Council did not have the resources or capacity to run a program. The Burlington Age-Friendly Seniors Council Housing Committee knew it was important to have an organization oversee a Home Provider and Home Seeker registry, assist with matching, and monitoring HomeShare living arrangements. Due the building awareness of Halton HomeShare, the Halton Region recognized the benefits of such a program and approached the Housing Committee to offer start the program, and they have the current resources available. This was so very helpful and meant that we were able to achieve our goal.